For me it is fundamental to respect the physical possibilities for the horse along with his psychological and mental ones. With many horses we find reduced mobility, and it is most important to watch out for this. 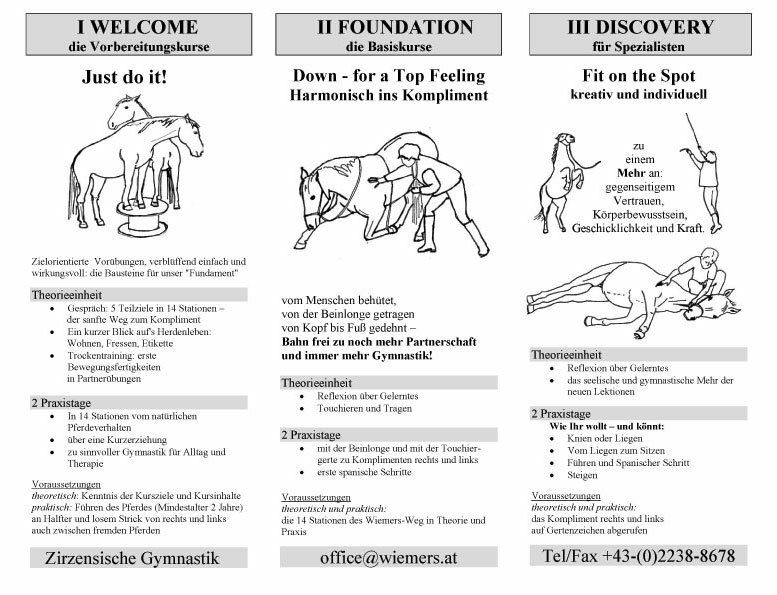 To be on the safe side in this respect the horse must perform the exercises voluntarily as well as precisely. So this is why we have pre-exercises to make sure the horse can do the rest of the work. During this work the rider/trainer also learns to better understand and usefully react to the body language of his horse. Since we work on the spot without forward movement, there is time to watch out for it and interpret its meaning. Never forget: A horse can only show with his body language that something might simply be impossible for him. But how “soft” a training will be depends greatly on how good the communication between horse and trainer already is. I recommend that riders do not begin this kind of work until the horse is between two and three years old. I would not advise people to bring youngsters to my clinics without first having done some basic groundwork in respect and communication. The important thing is that the horse should be able to be led with a rope on both sides and should be happy in a new environment with other, unknown horses. WELCOME contains the pre-exercises to develop the mental and physical requirements alongside. 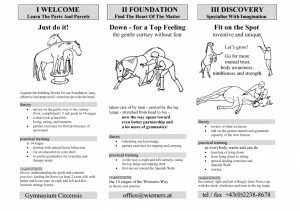 FOUNDATION teaches the basics: The curtsey is the all-important first move that the horse must learn in order to begin strengthening the muscles of the back, lumbar region, belly, shoulders and chest. The curtsey, the kneel, lying and sitting down, the Spanish walk and rearing on command extend the variety of training possibilities in working a horse from the ground beyond the customary leading, lunging and basic dismounted work. Circus exercises are based on natural patterns of the horse’s behaviour and, therefore, they also satisfy his essential needs: to strive for security within the “pecking order” of the herd and to create close personal relationships and friendships. Traditional dismounted work is widely appreciated and its advantages are also valid here: The satisfaction of the horse’s urge to play, the enhancement of his interest in common activities, the improvement of his ability to learn and to search for possible solutions to a problem in a relaxed manner – they all add to his knowledge of his own physical and mental capabilities and thus increase his self-confidence. But in addition to these advantages the trainer will gain the trust and respect of his horse in an extremely short time and with an incredible intensity. The horse will experience the circus work as an offer of friendship: He will live with the feeling of being his boss’ best friend. When the horse is competently asked to lie down, he may even have the same feeling of security as when he lies down within the protection of the herd. No other exercise can achieve a comparable effect for building trust and achieving relaxation. All circus schooling establishes, in a playful way and without enforcement, the position of the trainer as friendly authority, and therefore helps to create a base for further work. The general improvements in a horse’s suppleness, strength and balance, all beneficial consequences of correctly done circus work, cannot be overestimated. All circus exercises, and especially the curtsey and the kneel, strengthen those parts of the equine body needed for riding most. The muscles of the chest, back and hindquarters are improved and their attaching tendons and ligaments steeled. The exercise “lying down” and “getting up” (especially from the “sit”) require the most strength. This training can begin with a two-year-old and, therefore, it is a good way to use the time until it is broken. Young horses learn easily and willingly, they are grateful for the diversion, attention and stimulation, and they are, of course, more agile than older horses. When they are introduced to the rider’s weight at about the age of three, they will be particularly well prepared – physically as well as mentally. Circus schooling is also an ideal supplementary program for training the older or the convalescing horse. While dealing with health problems the horse will not only stay mentally active, but will also be enabled to preserve much of his physical conditioning despite the rest period. Auf meinen Kursen fielen immer wieder Pferde auf, die trotz rührender Anstrengungen, trotz Vertrauen und Motivation, z.B. ein Kompliment einfach nicht ausführen konnten. 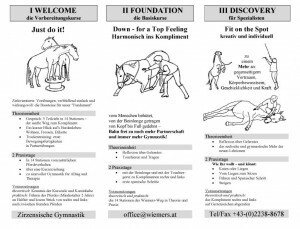 Fast immer ergab die Untersuchung dieser Pferde, dass sie aufgrund verschiedener Bewegungseinschränkungen therapiert werden mussten! Das gab zu denken! Es war dringend notwendig, sich mehr mit den körperlichen Anforderungen zu beschäftigen, die in zirzensischen Lektionen auf die Pferde zukommen – so entstand mein Wiemers-Weg der zirzensischen Gymnastik: Mit seinem durchdachten Aufbau mobilisierender und kräftigender Vorübungen vermeidet er nicht nur die oben angesprochenen Überforderungen. Er dient auch präventiv der Gesunderhaltung und kann vorsichtig eingesetzt sogar zur Rehabilitation herangezogen werden. Auf diesem Weg werde ich von Medizinern und Physiotherapeuten ermutigt und unterstützt. Ein kleiner Kreis spezieller Freunde (meine “Komps”, meine kompetenten Freunde) hilft mir, meinen Weg bekannter zu machen. Denn noch immer werden die inzwischen zur Mode gewordenen “Zirkuslektionen” häufig ohne die notwendigen seelischen und körperlichen Kenntnisse und Rücksichtnahmen unterrichtet. Mit dem Wiemers-Weg auf Tour in Deutschland ist inzwischen Ulla Dröge (ursula.droege@osnanet.de), in Österreich sind es Petra und Stefan Friedrich (petra.friedrich@aon.at). Sie bieten Unterricht und Nachbetreuung auch für Klein- und Kleinstgruppen an – klopfen Sie bei ihnen an!